This next paragraph is the most important paragraph you will ever read about putting. The slower a golf club travels, the more of an influence the face is going to have on not only where the golf ball starts (launch direction) but also where it ultimately finishes. Therefore, it is absolutely imperative to mention the orientation of the putter face at impact. This is MONUMENTAL in determining whether or not you’ll make a putt. Assuming the path of putter is moving perfectly down the target line (path of zero), let’s take a look at where the face is pointed at impact effects some common length putts, 5, 10 and 15 feet. We need to assume the putt is straight with no break, the player’s alignment is perfect with the center of the hole and the putt is struck solidly in the center of the face. The hole is 4.25 inches wide, making the center 2.215 inches from each edge. Degrees open or shut at impact/inches right of left of center of hole. 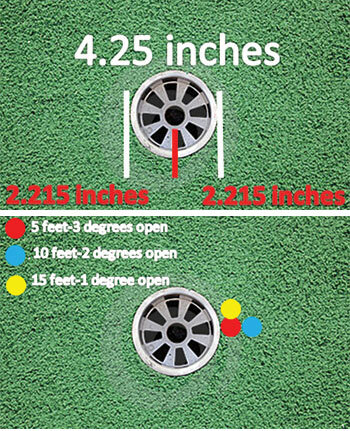 Looking at the color hole diagram, you can see at what degree open or closed your putt will miss the hole and by approximately how much (this is assuming the axis of the ball is not tilted). Seeing the margin for error on each particular length putt, it’s easy to realize given the dimensions of the hole when you’ll miss from each distance. From 5 feet, when the face is 3 degrees open or closed, the hole is missed. From 10 feet, only 2 degrees and the hole is missed and from 15 feet only 1 degree open or closed and the hole is missed! The margin for error with the face in putting is so slim. If you want to make more putts, make sure the face returns square to your line! There is nothing better you can do for your putting than to work on squaring the face each and every putt. Find straight putts to practice, putt alignment sticks down to form railroad tracks stemming from the edges of each side of the hole. Hit putt after putt. Any variation in where the ball enters the hole, other than the center, is a putter face which is open or closed. Scott Sackett, GOLF Magazine Top 100 Teacher the past 14 years, just voted as one of Golf Digest’s Best Teacher in the State for the 10th year in a row. Also, Director of Instruction at Park Meadows CC in Park City Utah (June-September) and while in Scottsdale teaches at McCormick Ranch Golf Club. If you would like to contact Scott, visit www.scottsackett.com.